Today I was at Lincoln, a cafe and bakery in the outskirts of the cities of Pasadena and Alta Dena. It’s a restaurant that LA Times Food Critic Jonathan Gold most recently reviewed so it made sense to go check out the place. I admit that I didn’t have much of an appetite when I arrived having just finished a late breakfast. To keep it simple, I ordered dessert and coffee. There was a pretty decent selection of pastries on the counter, but nothing fancied me more than the Chocolate Lavender Cake. What a gorgeous cake! 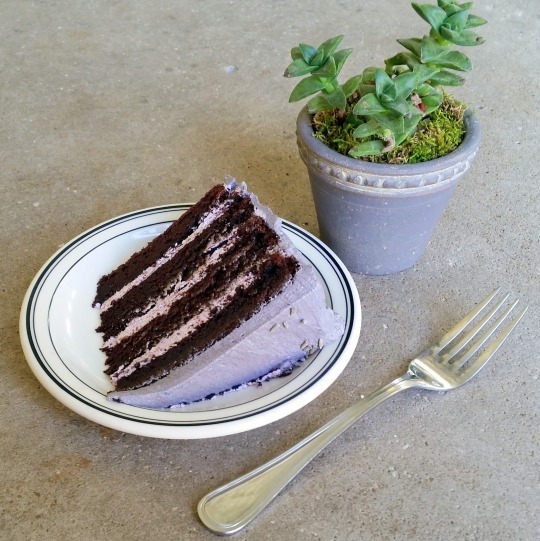 The chocolate cake itself is not too sweet and the Lavender frosting is heavenly; slightly sweet, the right texture, and just the right amount of frosting in a slice. 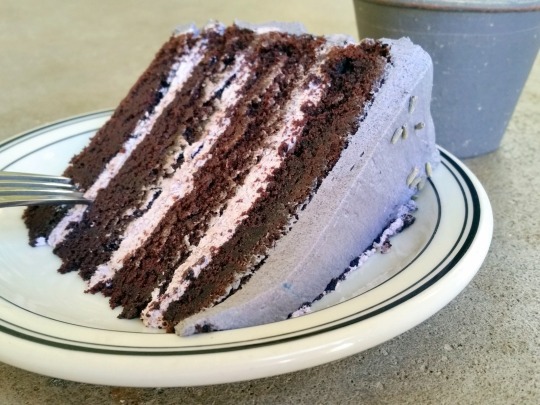 Oh, and you can definitely taste the hint of lavender with each bite. Lincoln is a cafe and bakery that only serves breakfast and lunch. It is sort of an extension of Chef Christine Moore’s The Little Flower Candy Company; the flagship the cafe and bakery also in the Pasadena area well-known for its Salted Caramels and Artisan Marshmallows. The individual gourmet sandwiches and salads are priced between $8 – 18. Pastries and desserts range from $4 – 8. Credit card accepted. Free parking.